If you are suffering from pain in the ball of your foot, let the doctors at Advanced Podiatry evaluate you for a neuroma! 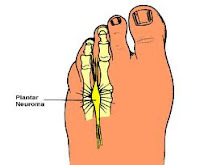 They have advanced diagnostic treatment such as ultrasound to identify the neuroma as well as cryotherapy, an advanced in-office minimally invasive procedure. Call 813-875-0555 for an appointment today!